I love shrimp, especially the ones that I fix myself. I also enjoy shrimp fixed just about anyway that they can be done. Even fried shrimp are okay as long as they are not heavily battered. On Wednesday night we decided to try the Fairway’s all you can eat shrimp and fish special for $9.99. I got the shrimp and my wife got the fish which was whiting. We both enjoyed our meals. 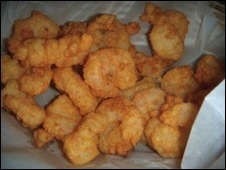 I restrained myself and only got one refill basket shrimp (pictured above). If I had been lucky enough to be with another eating partner I probably could have made it through another basket with a little help. Still I had plenty, and we will probably be back for another patch soon.